the Medical Model of Disability” is a way of explaining how some people and organisations understand disability and how disabled people are treated but is not considered to be an inclusive approach to disabled people. 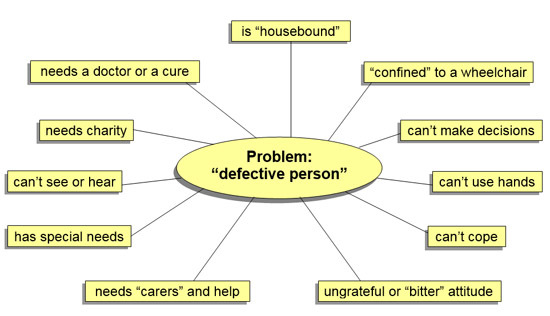 Much of this language is very negative and does not really describe the experience of disabled people. All of us in society need a doctor and all kinds of help at different times throughout our lives but many people, especially many professionals believe that they “know best”, do not always treat disabled people with respect, don’t listen to their views and experience and don’t consider discussing options and decisions directly with them. Acknowledgements: This version of the medical model of disability has been adapted from models developed by Unison NW and Pam Thomas.